While the Thin Man series of films is ripe for inclusion on this site, the genre of “gentleman detective” was certainly not the lone province of William Powell and crew. The Lone Wolf was another, this one a jewel thief named Mike Lanyard who was featured in upwards of 20 pictures, a lot more than Nick and Nora. This incarnation was portrayed by Warren William, doing a good William Powell impression, and was released in the magical year of 1939. The Lone Wolf, debonair jewel thief, has quit his jewel thieving ways and is settling down with girlfriend Val Carson and daughter Patrica. A gang of spies looking to swipe some plans for a new piece of anti-aircraft artillery frame The Lone Wolf for a theft in order to blackmail him into helping them. With the police aware of his past and unwilling to help, The Lone Wolf takes on the spy gang with Val’s mostly unwanted assistance. 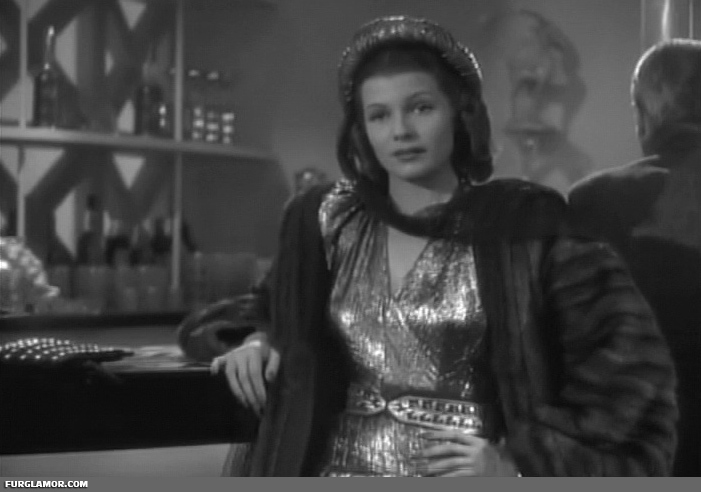 Despite having Rita Hayworth on their side, The Lone Wolf foils their plans and sends them all to the slammer. It’s 1939 and this is a “gentleman’s detective” film, which means it’s only slightly less likely to have amazing furs than a “madcap heiress” film. 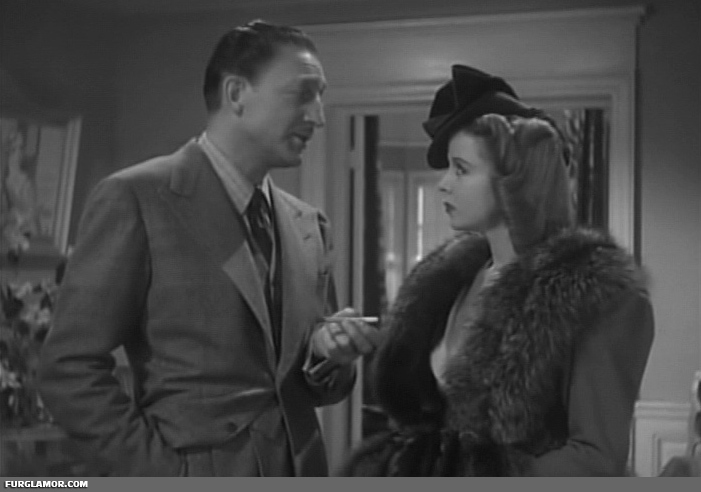 It is certainly no disappointment in that regard, as we have both Ida Lupino and a very young, pre-super-stardom Rita Hayworth in large fox coats. 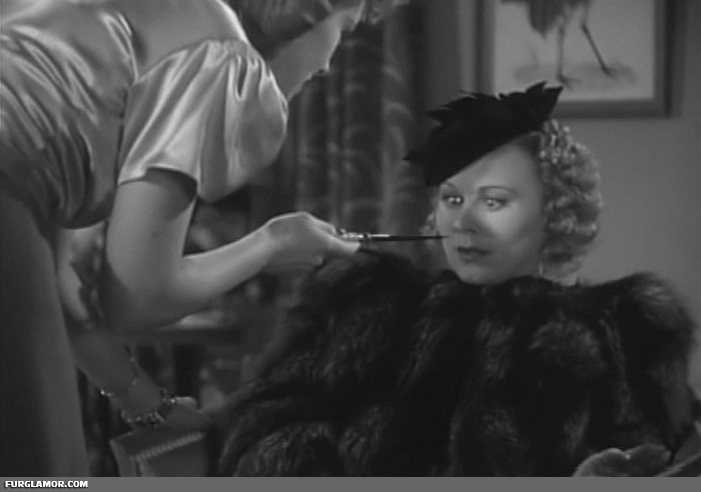 Ida spends most of the film in one of 2 furs, while Rita similarly, is rarely out of fur herself between a full length mink and large black fox that befits her stature as main squeeze of the spy ring leader. This is Val Carson, Mike Lanyard’s girlfriend who supplies much of the film’s comedy. 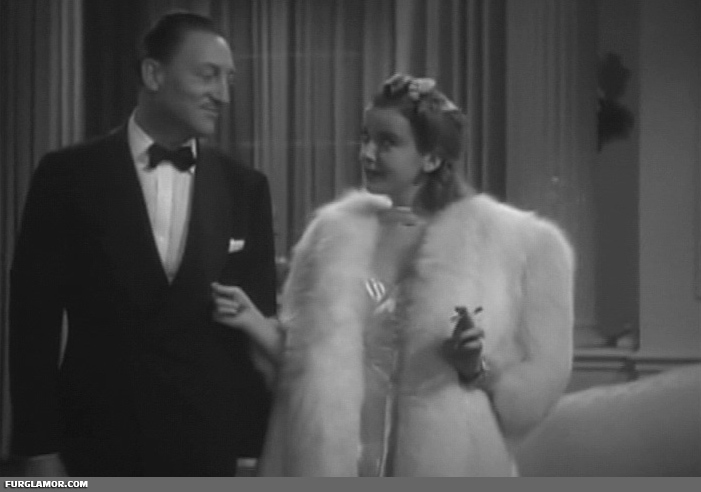 Played by a barely over 20 Ida Lupino, she spends a great deal of time in this silver fox trimmed jacket. Though not visible in this shot, a silver fox muff accompanies it usually. There’s the muff, a lovely combination with the hat and most likely a silk blouse. And here is Karen, played by Rita Hayworth, also barely over 20 and looking very refined in this full length short-haired coat as she prepares to crash a date between Mike and Val. Crash she does, as Miss Lupino’s expression indicates how overjoyed she is this development. 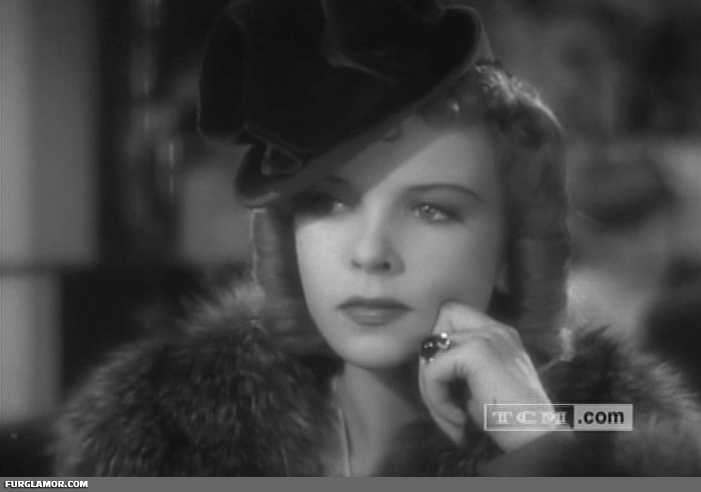 Throughout the film Ida Lupino’s expressive face is one of the highlights, and here it is surrounded by silver fox fur. Ida and Rita are not the only ones in fur in the film. 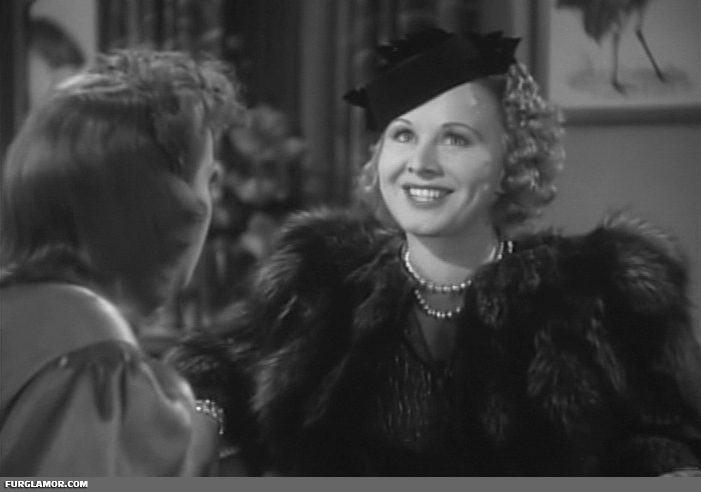 This is Helen Lynd, playing a prospective buyer for The Lone Wolf’s completely legitimate antique business, who must deal with Val Caron’s jealous streak over her boyfriend. Really jealous… Though perhaps not obvious from the stills, the scene is rather amusing and showcases Miss Lupio’s comic chops. Unfortunately one of the few scenes in the film where she’s not wearing fur. 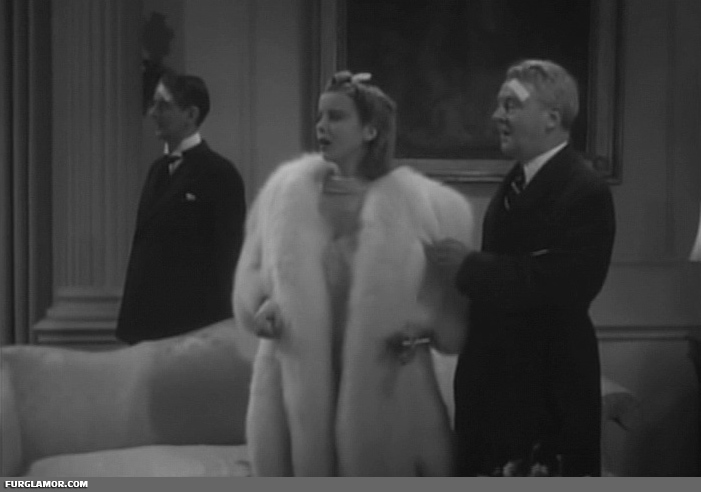 Somewhere around act 3, both Ida and Rita step up the fur quality, with Miss Lupino winning handily in this white fox coat. Briefly seen holding a cigarette in this sequence, though not actually smoking, the white fox is a classic example of the period, full, but lacking any sort of collar or cuffs, cape-like. Not to be completely outdone, Rita and the gang show up to help her show off her black fox stroller coat. No doubt it’s black because she’s the bad girl in this flick, accented by her veiled black hat over her dark brunette locks. To drive that point home, she and Ida share the screen, good girl in white fox, bad girl in black fox, the way the universe intended it should be. 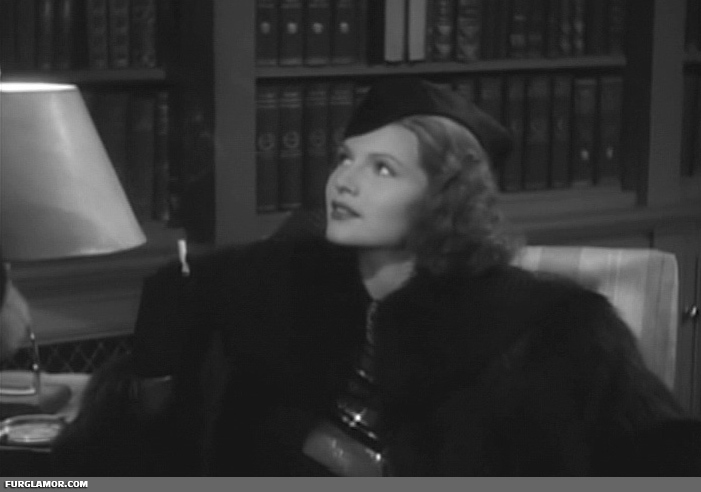 Like Ida earlier, Rita briefly holds a cigarette but never actually does much smoking. One more shot of the 2 together briefly, because two great foxes are always better than one. Finally, one of the best shots of Ida Lupino’s white fox coat occurs just before “THE END”, here at the police station after The Lone Wolf’s been hauled away as his chip-off-the-ole-block daughter presents the keys to his cell. Though certainly not the only reason this film deserves mention, it is great film for those interested in “fur runtime”. Not quite a Forever Lulu, but you certainly won’t fall asleep waiting for the next fur to show up (and hang around). In honor of The Green Fairy’s suggestion, I’ll post some “box stats” for each film from now on so people know roughly how long you’ll be enjoying fur on screen in the films I post. The Lone Wolf Spy Hunt definitely clocks into the top 3 at this point. I have this film in the Lone Wolf collection and I was very impressed with Ida Lupino’s furs and how long they were on screen. The rest of the films were not particularly ‘furry’ but Evelyn Ankers wore a magnificent stole in ‘The Lone Wolf in London’. Incidently there is a rather interesting scene where Alan Napier’s (Alfred from the 60’s Batman series) conniving girlfriend is demanding that he purchase her more furs. I have a very old cap of The Lone Wolf in London, not one quality enough for here, though. Always open for suggestions, particularly if they’re coming on TV soon (so I don’t forget). Oh, but The Mad Miss Manton doesn’t count ;). As promised; here are films in my collection that I would rate as Fur films. I will post in alphabetical order. ‘Dressed to Kill’ starring Patricia Morison. As far as i can remember she only wears three different furs but this film is well worth watching just to see them. Not only does she wear some gorgeous fur but she is also gorgeous; her character is conniving, spiteful and so wonderously sexual. The film used to be on Youtube but i have not checked. ‘Gambling Ship’ starring Benita Holmes. She wears several different furs that are all very impressive; i enjoyed this film just for the furs. Referring to ‘Lone Wolf in London’; is there any way that i can post a picture of Evelyn Ankers? You can send them to webmaster ‘at’ furglamor.com and I can create a gallery for your pics. Love to have contributions. Gambling Ship I don’t have, but turns out I do have an older cap of Dressed to Kill, or as it was shown on Encore Sherlock Holmes in Dressed to Kill. I have her in 2 furs, white fox and silver fox, but I’m betting the 3rd may have been a short hair, thus it probably didn’t make the cut. Benita was definitely a bad girl. Her henchman kills some guy, and he has the bad taste to expire on top of her white fox stole, which she then callously drags from under him as she sashays out of the room. Bonus points for the opera gloves, and a cigarette holder away from perfection. BTW, if that email doesn’t work, just comment here, it should, but just in case. Picture sent; I hope that you receive it. ‘Love is News’ starring Loretta Young. 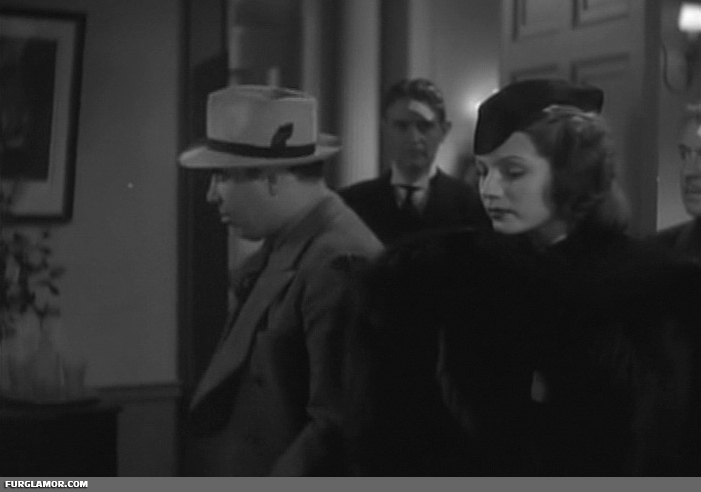 She and other ladies seem to be wearing fur throughout the film. ‘Love Under Fire’ again starring Loretta Young. Only one fur that I can recall but she wears it for a large part of the film; and what a fur! PS I wonder if you have ever watched ‘Breakfast for Two’ starring Barabara Stanwyck only it looks to be good. PPS I presume that your caps from ‘Born Reckless’ are from the television only I am trying to get hold of a copy. Picture recieved, and I’ll set something up tomorrow. Love Is News. And now it has a link to the gallery. Love Under Fire is also unknown to me, I’ll try to check that one out. Breakfast for Two is currently on my major “want” list. TMC showed it once and the caps I made turned out poorly, which is highly annoying because the white fox in that film is epic… Not quite Awful Truth but amazing just the same. Born Reckless was indeed on Fox Movie Channel. Everything I have is from TV, though I’ve recently discovered a way to mirror my “process” with DVDs, I haven’t any to really test it out well with, though.